I am currently sitting in a comfy hotel room with an absolutely gorgeous view of the most perfect crystal clear water you have ever seen. The air smells of sunscreen and there is a slight taste of salt in the air. All around me, families can be heard and seen having an absolutely amazing time. I along with my youngest Jase were lucky enough to be invited to experience all that the Hilton Sandestin Beach Resort has to offer. Yesterday we drove the three hours over to Destin, FL. and had a day absolutely packed full of fun and sun at the Hilton Sandestin Resort. It is a gorgeous property and we are up for another amazing day today, so be sure to check back for more info and of course pictures! I should probably start with the room, as that is usually the most important part of any hotel experience. We were given a Deluxe Jr. Suite to stay in and I was instantly amazed at the space when we walked in the room. 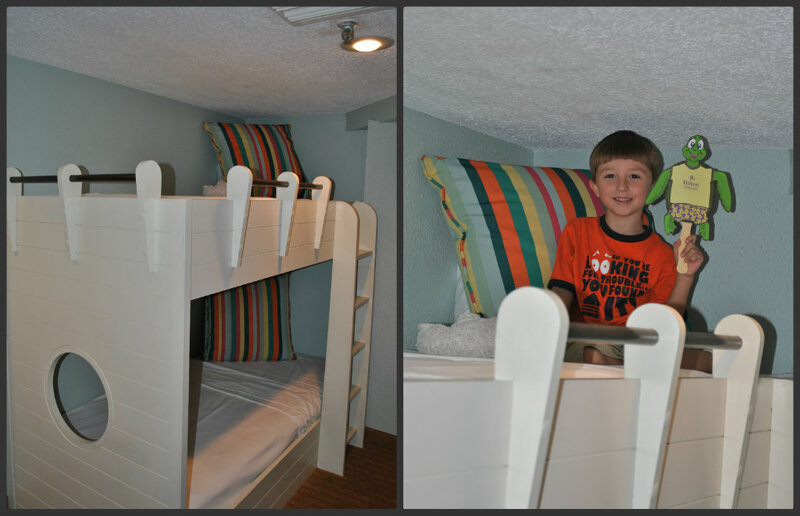 As you first walk in, there is a set of bunk beds with a private TV area for the children. This is an adorable touch and Jase enjoyed getting to sleep on the top bunk for once. As you walk down the hallway from the kid's area, there is of course the bathroom. Take a moment to feel those towels as you walk by, they are the softest hotel towels I have ever experienced. Once you get to the end of the hallway, the area opens into a very large regular hotel room area. The bed is huge and is packed with plenty of pillows and comfort. There is a table/media area, a pull out couch, a large flat screen TV, microwave, coffee maker, mini fridge and one of the most amazing views I have ever had at a resort. Also, did I mention that the Internet service here is extremely speedy? A welcome addition when most resort connections are less than fast. Seriously, could you ask for a more beautiful view whether it is day or night? 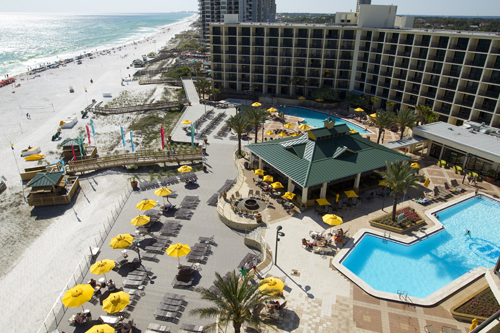 The Hilton Sandestin Beach Resort has two kids' programs. The Kids Krew is available in season from 9:30am to 1:30pm for ages 5-12. It is a fun filled program full of age appropriate activities. They have a different theme each day of the week and take the kids shell collecting, on safari hunts and more. The cost is $50 for the first child and $40 for each additional child. This price includes lunch and a t-shirt that would make a great souvenir! Not to mention, it gives the grown-ups a little precious alone time on vacation. Having fun on a scavenger hunt with Sunny the Sea Turtle. There is also a night time program called Kids Night Out from 6:00pm-10:00pm for ages 5-12. This is the perfect option for date night and is the same price as the day time session, with additional fun themes such as Secret Agent Night and Pirate Pandemonium. Sand castle building contest. Check out that castle! Some of the staff members from the children's programs led us through a scavenger hunt, coloring and games for the kids as well as a sand castle building contest yesterday and I can tell you that each and every one of them was fantastic and qualified. For example, Cotton Candy Courtney is a kindergarten teacher during the day, so there is no fear of leaving your children with unqualified staff. We rounded out our night with a yummy meal served buffet style outside by the pool deck and along the beachfront. The macadamia nut cookies were to die for and the view could not have been better. After a dip in one of the hotels three pools, we returned to our room and had this delightful treat waiting for us. Just a hint of the enjoyment that awaits me on my spa visit later! Check back in tomorrow to see what we experienced, as well as learning about the Hilton Sandestin Beach Resort, amenities, Spa and restaurants! * I was invited to experience the Hilton Sandestin Beach Resort, but all thoughts and opinions above are entirely my own. I love the bunk beds in the room! So fun. I'm so sad that I was invited but I couldn't attend. How fun! I look forward to reading more tomorrow, looks like a great place!! I'd love to go their with my son... he'd love it! My husband has stay here once before on business. He loved it! This looks like such a great place to stay! We would love it here! This hotel sounds amazing! I love that you can have fun without even leaving and the small touches go a long way. Sounds like a great place to visit! I have so many posts from this trip started LOL. I need to work on them next week to finish. this was such a great experience and it was great meeting you. The bunk beds are so neat! Wow love the pics especially your room view of the ocean. Looks like a lot of fun and a very nice resort. Love rooms that have a microwave and good high speed internet service. I love the bunk beds and and it's really quite spacious in the rooms. The view is incredible! Living in Florida, I'd never think to go to Sandestin, but reading your posts have made me think twice about it. Now I want to go on a little vacation. I love how they have kid activities! How fun that they offer programs and activities for kids! This place looks awesome, I want to go!! !